Cheers Roger for being so cool about sharing material, you're an open source hero. Roger's done up some dandy graphs demonstrating the trend as we move into the fall. 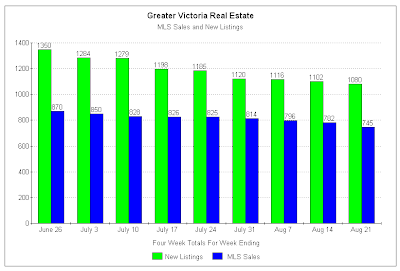 This first graph shows you the three month trend of new listings (green) and sales (blue). 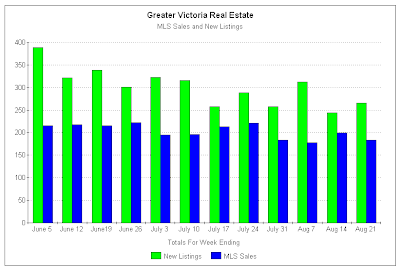 Please note that sales have been fairly consistent through these months (which is not grossly abnormal, though I would have expected the peak volume month to be May or June, not July) but they have still declined into August. This next graph really shows the decline over time. Each bar shows the total of the previous four week's activity. This last graph makes it look like total listings are falling off a cliff. They are not. This is perfectly normal and inventory, while not high, is certainly not at a level that will support sustained upwards price pressure. Months of inventory for the week ending August 21 is: 4.7 ish. Average prices were flat or falling between July and August. The rest of the year should show declining sales volumes, flat inventory levels and I would guesstimate an average SFH price drop from today's levels by about 5%, showing an annual average price change of + or - 3% from 2008. Industry will spin this as "stable." I'll tell you I think the numbers are really a disappointment considering the volume of FTBer's brought into the market by "free" money. The bubble didn't burst, but it didn't get hyper-inflated either. What will happen next remains to be seen. Over the weekend, the VREB published this in the local paper (H/T to Roger and GoneTooFar for links). Through crafty layout, they made their advertisement look like a factual education piece. But it was so full of fallacies that we can't just let it go un-responded to, can we? I won't cut and paste the whole thing. But I'll rebut a few points below. Maybe. If you take out a 25 year mortgage. But the average first time buyer in Victoria these days doesn't. 35 year amortizations have become the new norm at today's prices. So while past experience suggests this claim may be accurate, it is completely unknown, and relatively unlikely, that future experience will prove this theory correct. You see, 25 years ago, a 25 year mortgage was normal. And it was normal for people to pay off their mortgages in 25 years or less. Today, normal is entering the property ladder, using extended amortizations and moving through the market in multiple transactions, constantly refinancing and removing equity from homes to purchase new homes worth more. We don't know what future experience will be in terms of mortgage pay downs because we've never seen the kind of mortgage product innovation we have today during past real estate cycles. The VREB is applying the old rules to a new game and expecting the same outcomes. I say the ref should be calling a penalty on that play. What this point should have said was "Buying a home is a very EXPENSIVE way of saving regularly." Can you think of a financial product that is more expensive to purchase, costs you more to sell, costs you more to maintain, costs you more to service and gives you worse liquidity? I can't. Some rough back of the napkin math I did on the weekend on a $375K purchase worked out to be an approximate 35 year cost of $1.25M. In other words, just to break even, you'd have to sell that property for $1.25M once you'd completely paid it off, and then where would you live? That's highly possible as it's only a 3.4% annual ROI, but I can think of many more effective ways to save and invest less money for greater 35 year returns at far less cost and far greater liquidity. Furthermore, any other industry that offers the consumer an investment product or investment advice has mandatory disclosure requirements on every piece of advertising it does. Why is the real estate industry allowed to market their products as investments with no mandatory disclosure statements, no requirements whatsoever about qualifying consumers etc and no industry financial regulatory oversight? This is true. Our communities hate renters. Renters are a scourge. An infestation. They destroy communities. So naturally, communities exclude renters and excluded people tend to be rootless and uninvolved. It's a vicious cycle. You owe it to your families to never let this happen to you. 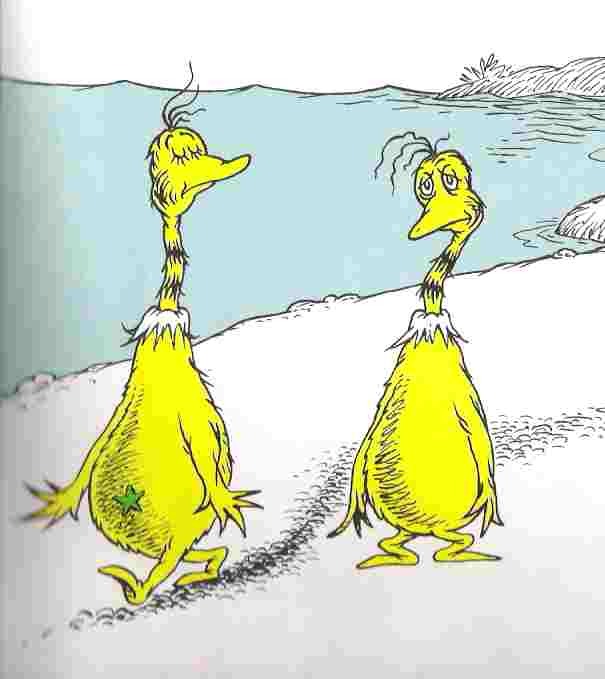 Be a Star-bellied Sneech, not one without. If I'm a member of the VREB, I'm embarrassed by this advertorial. I also find it odd that in the middle of a great big first time buying boom, the VREB felt it wise use of dollars to try to further appeal to first time buyers. Could they know something we haven't seen yet? Like maybe the buying is slowing down again and that FTBers are either exhausted or parked on the sidelines expecting to pay less again in the near future? Let me start out by stating clearly that this post is not an attack on BC's REALTORS®. I've often stated in the past that when buying real estate, it's in the best interest of the buyer to use a dedicated buyer's agent. After a conversation a while back with someone who has taught me a lot about real estate, and subsequent self deliberation and research, I've changed my mind. Dual agency is the way to go for me. Dual agency occurs when a Brokerage is representing both the buyer and the seller in the same transaction. Since the Brokerage has promised a duty of confidentiality, loyalty and full disclosure to both parties simultaneously, it is necessary to limit these duties in this situation, if both parties consent. Sure, you need to get consent. But what agent out there isn't going to try to double-end a potential deal? Which brokerage isn't going to encourage their agents to attempt this? And how many sellers will object to seeing an offer? I'm guessing few. Average single family home price is currently $565K. Average commissions are 6% on first $100,000 and 3% on the rest ($6000 + $13,950 = $19,950). If you use a buyer's agent, the deal is usually split 50/50. So each agent walks away from the deal with almost $10,000 that they then in turn split with their brokerages. I'm not sure how many agents get to double end deals or how often they do, but I'm guessing it's not a common occurrence. I'm also thinking it's a mighty big carrot to get a deal done. And those "bonus bucks" present some wiggle room for everyone involved in making the deal happen. Let's say I pop into an open house, like what I see, and decide to make an offer. I call the listing agent, let them know I'm pre-approved, and I'm ready to make an offer with few subjects. The listing agent will have to do two things, get me to sign a dual agency agreement, and then get the seller to do the same--all before any offer is presented. This triggers two events: 1) the agent knows they have an opportunity to get a deal done and 2) the seller gets excited that an offer is coming in and their house may sell. I've already decided what I'm willing to pay for the home. Let's say the list price is $565K. My price on the home is $545K. I know the place has been on the market for a month and that no previous offers have been presented. I offer $530K subject to inspection (I have my own inspector, not the inspector referred by the agent). The dual agency agent must present this offer to their seller as they are now equally representing me and the seller. The seller is likely initially disappointed by what they would consider a low-ball offer given the current market. The agent though is also representing me now too and has a duty to try to get the seller to counter to keep the negotiations open (and a financial incentive to get a deal done for themselves). The agent brings the seller's counter offer back to me: $557K. The negotiation has started and everyone is invested in getting the deal done (at least they think I'm invested, but I'm an unemotional party to the deal who will walk before paying more than I'm willing to). I give the agent my counter, and tell them to instruct the seller that this is my final offer and set a time limit to respond (4 hours) as there are other homes I am interested in: $545K subject to inspection, flexible on the possession date but not shorter than 15 days and not longer than 75 days. Negotiating the deal now falls completely to the seller and the dual agency agent. The seller has an offer, but it falls short of their expectations and they know they need to pay commission too. They also know that the agent stands to gain substantially more than if there were two involved. They were prepared to pay almost $20K in commission, and they priced that into the price of their home. They expected to walk away from the sale with somewhere in the neighbourhood of $535K to $545K. They would have liked to have seen a sale price of $550-$555K, a difference of only about $5K-$10K from the current offer; coincidentally, just about the amount of the "bonus bucks" the agent is set to earn. Selling houses costs money. It costs money to the seller, but smart sellers price the commission into the sale price of the home. But selling houses also costs a lot of money to the agents. Having that house sit on the market longer means more dollars spent advertising, more time spent marketing, more time spent in open houses and less time spent selling other homes or with loved ones. Do you think making that sale is worth meeting the seller somewhere in the middle to that agent? "Tell you what, let's get this deal done. I'll drop my commission from you to $16K even. You'll get very close to your price and everyone will be happy. OK?" I think this gets the deal done--I could be wrong. Of course, there are a handful of variables that will influence this scenario, including the state of the market and the buyer's, the agent's and seller's abilities to negotiate. But considering the complications of the alternative, I think my money will be on handling my own negotiation when I find the right time to buy because there is more money in play and therefore more negotiation room. Please remember, I'm not an agent, I've made some assumptions about dual agency that some posters may be able to clarify/correct in comments, I'm not currently negotiating deals and I won't buy when everyone else is nor will I engage in multiple offer scenarios so I've ruled them out of this hypothetical situation. Please tell me your thoughts in comments, I'll be interested in hearing the discussion. I don't know who was more excited by the news of a 19-year high in July sales volume this morning, the VREB or the TC. Both should be ecstatic with themselves, after all, they both managed to get themselves on the front page of the Vancouver Sun for a stretch of hours on a day when Vancouver discovered it's 17th homicide of the year--and they say the news media is all doom and gloom. A very interesting thing occurred though; two papers, same story, but one major difference. Apparently, in Vancouver they invite readers to engage with the story by allowing comments. Shocker, I know. I was almost as taken aback as I was last month when the TC had comments turned on, oh so briefly, for a real estate story. Well, would you look at that! Front page news on the Sun and comments too to boot! Welcome to the interwebs, where you can read and engage, what a new fangled crazy idea! Now, I know, I know, you're probably thinking I've spent the better part of the day with a bottle and now I'm just ranting a wee bit too much about something that really is inconsequential. "Where's the story" you say, "this is nothing new. After all, 933 homes were traded last month, shouldn't we be talking about that?" @timescolonist: That's hot! 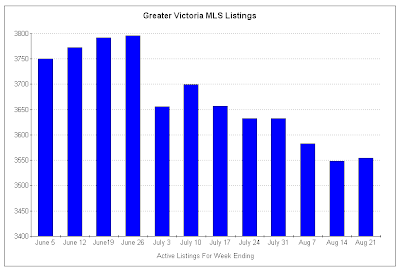 Greater Victoria's housing market regains its sizzle, with most sales in July since '90. @househuntvic: @NeedsAnalysis I think @timescolonist has a "push" only twitter account. Just like their real estate reporting, it's set to "regurgitate." @timescolonist:@NeedsAnalysis @HouseHuntVic We aren't opening comments on all stories as we must watch them & we're a bit short-staffed this week. Sorry! @NeedsAnalysis: @timescolonist Tnx for reply. Unfortunately the TC has not allowed readers to respond to real estate stories very often in the past. @timescolonist Many think it is because you don't do in depth investigative journalism on real estate and don't want to offend advertisers. You know, I'm actually starting to feel sorry for the people stuck in the rot that is quickly overwhelming "journalism." After all, they've lived so long in a world where the ability to challenge their journalistic authority was mediated by two-day delivery paper mail and an editorial panel too consumed by the task of ensuring the city's social page photo content contained the appropriate image mix of advertorial clients' partners and children to bother approving half of the incoherent letters to the editor from the poor schleps with an axe to grind about public breast feeding or concert goers dancing in the seated area of the new arena. @timescolonist: @NeedsAnalysis Even on good days, we can't open comments on everything. But we'll make a note about real estate stories. Thx for feedback. Which is the whole point of my post. I won't flatter myself by thinking the writers and editors spend too much time reading my blog (given the short staffed situation over there and all), but we have confirmation of their knowledge of my little internet corner here. So editors et al, one simple request: do some digging on your local real estate stories. Here's an original story idea I'd love to see you pick up: use Roger's Buy versus Wait spreadsheet to run financial calculations on the implications of buying versus renting over the near future. There, I've HARO'd for the day. HHV out. Some of you will remember last fall, during the worst stock market crash in recent memory, the Prime Minister of Canada declared a "buying opportunity." Many Canadians, and not just politicians, vilified him for his unsolicited financial advice. I thought it'd be a fun little exercise to track what has occurred since then and maybe offer some reasons why we are where we find ourselves today--in a place that no one in these parts has accurately predicted. On October 7, 2008, the TSX was at 9,829 points. It "bottomed" on March 9, 2009 at 7,566 points. Today, the TSX is at 10,936 and climbing. If you rushed out and bought an index fund on October 8, 2008, you'd be "up" about 9% today. If you were patient and picked a better buying moment, you could be "up" almost 31%. Considering all that has gone on in the global financial market, I find these numbers remarkable. At the same time, I struggle to explain the index numbers as a whole on the basis of any sound fundamental analysis (although when you look at individual stocks, you can see stars, dogs and reasonable valuations, especially in some financial stocks). What happened in the local housing market? July numbers are out, along with hyper-spin, and the median price dropped to $520K. My earlier guess was off, I had expected price hikes, avg and median prices both declined MOM. What this indicates is that it is properties priced below $500K that continue to fly off the shelf as fast as they are listed while properties priced $600K or more move slowly if at all. Official sales stats are: 516 single family homes, 252 condominiums and 103 townhouses or 933 in total--the highest July sales volume in 19 years. The "buying opportunity" in housing occurred exactly 3 months after the fall declaration: interest rates dropped to equal the lowest on record and buyers bought. But real estate analysts should be concerned that previous high water marks weren't surpassed--considering the frenzy during the fall of 2007 and spring of 2008 was happening with interest rates more than 2% higher than today's. These are weird and wacky times. I suspect we will be offered new buying opportunities in the near future.